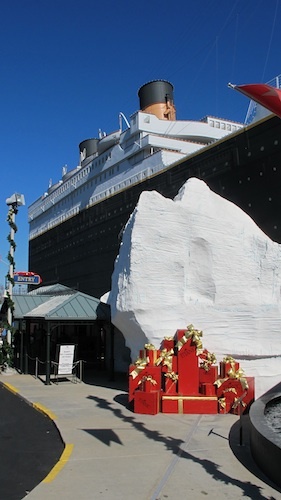 Must see Branson at Christmastime. 5 must see Christmas events in Branson at Striped Pot. 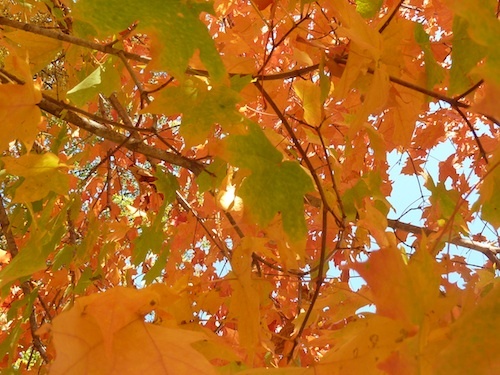 There is always more to do and see in Branson than is possible. But if you do have time, stop by the Titanic Museum. 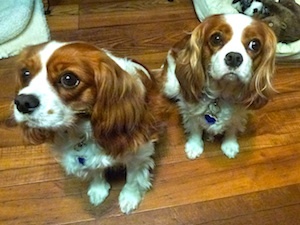 Say Happy Birthday to the ships’ dogs. Molly and Carter. See the Titanic in it’s Edwardian Holiday best. Photo: PBH. Buy Titanic tickets, see times and dates of special events. Your best price is through the Titanic Museum web site. Branson Area Festival of Lights. Through Dec. 31 at Dusk – 11 p.m.
5 must see Christmas events in Branson at Striped Pot travel magazine. For more holiday festivities, contact the Branson/Lakes Area Chamber of Commerce/CVB . Sometimes called a spider plant. I think it looks like the floral version of fireworks. Grandmother had an older variety that was harder to grow. This Señorita Blanca Cleome is draught tolerant and easy care. No deadheading or pruning needed. 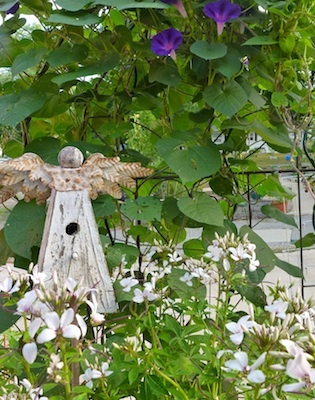 You can read more and see the cleome at Garden Bloggers Bloom Day. This color works well in a cutting garden or butterfly garden. The white blooms allow other plants to glow. The pale lavender tint compliments all the flowers. I would recommend this annual to others and I will buy it again. There are no seed pods dropping everywhere because the Señorita Blanca Cleome plant is sterile. Señorita uses it’s energy to bloom continuously, instead of making seed. I’ll take that improvement any day. From spring to first hard frost, these soft colored flowers on sturdy stems bloom nonstop. During our record breaking heat, the cleome held it’s own. Growth slowed but did not stop. The plants received regular water and occasional liquid fertilizer. 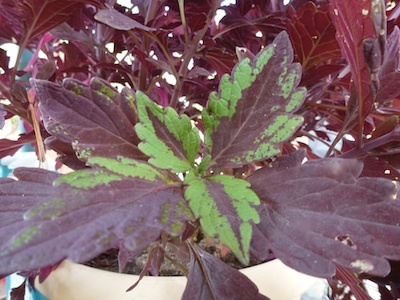 Come spring, look for this plant at independent garden centers. 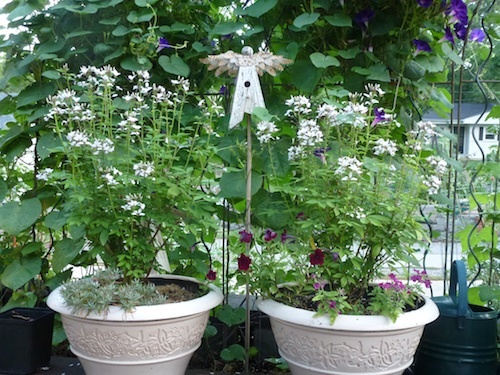 When designing your containers this spring, keep Señorita Blanca Cleome in mind to add height to any container, perfect for cottage gardens, butterfly and cutting gardens. This plant was sent to me by Proven Winners for trial. In my zone 6A, southeast Missouri garden. 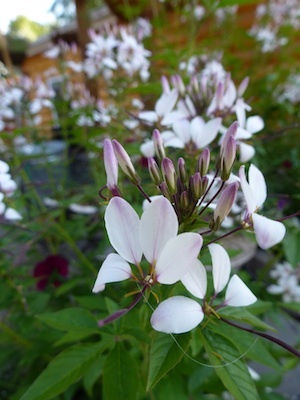 Señorita Blanca Cleome showed no signs of disease or insect problems. If you had a hard time getting cleome to grow, them give them another try. Proven Winners has a better cleome. I am pulling the last of the tomato plants for the year. 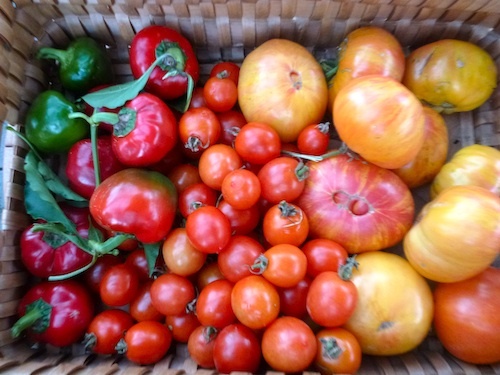 But before I do, I picked a half dozen Copia tomatoes. These tomatoes grow on big, sprawling vines. Place sturdy stakes or cages early. 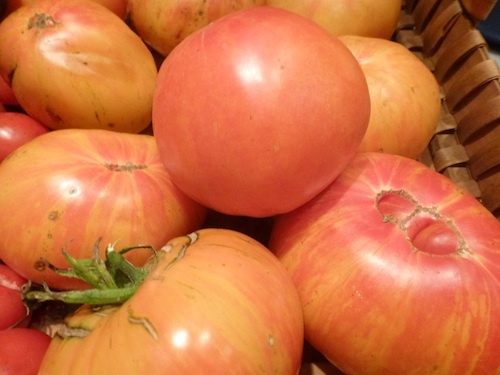 Hub Pages has all the info on the beautiful and tasty heirloom. 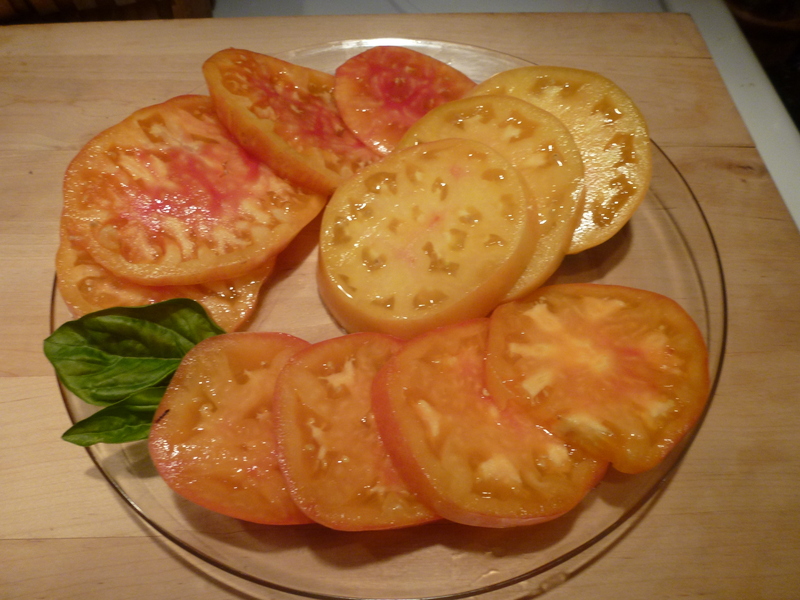 Read More: Best and Beautiful Copia heirloom tomato. I bought seeds at Baker Creek Heirloom Seeds. Each packet contains 20 seeds. Save any extra seeds in a cool, dry, dark location. You should be able to use these seeds for the next couple of years. 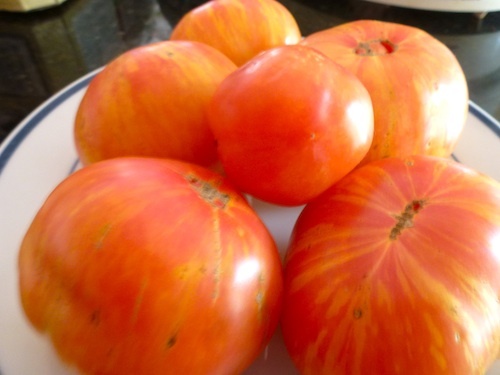 A cross between’Green Zebra’ and ‘Marvel Stripe,’ both excellent heirlooms. Photo: PBH. Dragon Tongue fresh tender snap beans. Close your eyes, and taste one of the best fresh snap beans. Prepare as you would any green beans. To keep their color and tenderness, this bean is best served fresh. Excellent lightly steamed and served with chive or dill butter. 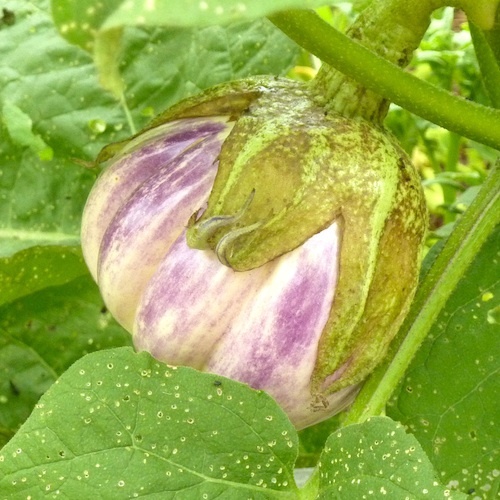 Rosa Bianca eggplant is not bitter, an Italian heirloom eggplant. Creamy white teardrop shaped. 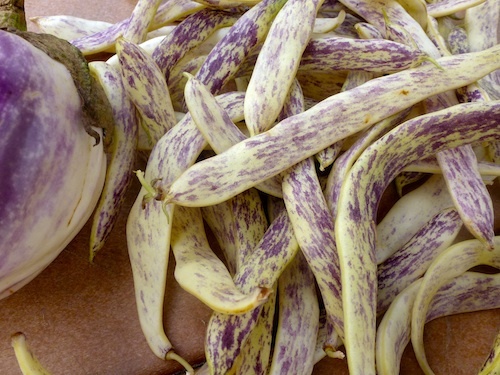 Taste this eggplant and you will know why it has been around for generations. The mild flavor of this eggplant is perfect for eggplant parmesean or vegetable lasagne. 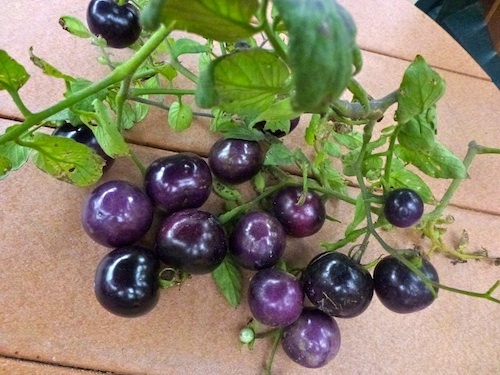 Indigo Rose are very blue saladette size tomatoes. Very high in Anthocyanins. The blue pigments, the Anthocyanins, are what makes the reds, purples and blues of fruits or vegetables. Anthocyanins have been linked to cancer fighting and anti aging benifits. Read more about where to find these blue foods on My Hub Pages. It would be hard to choose between annuals and perrenials. Either way would be more work and very limiting. 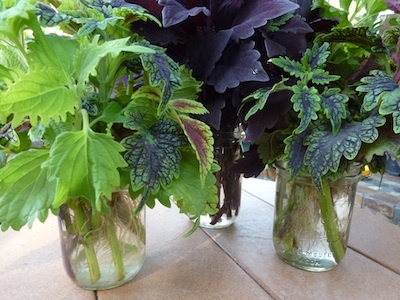 Annuals and perennials make a great team. 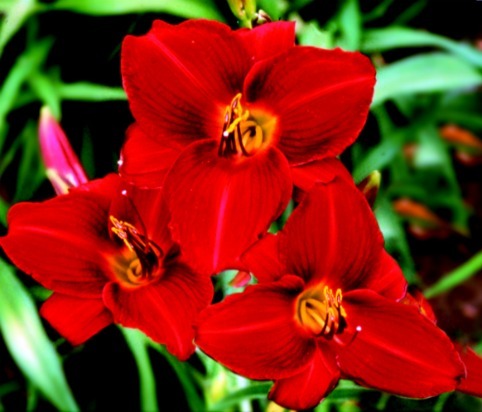 Frankly Scarlet daylily. A favorite easy care perennial. 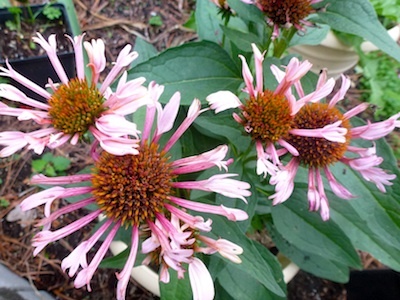 4″ bloom, 24″ tall, Early-Mid Season + rebloom, a 2003 All-American Selection. 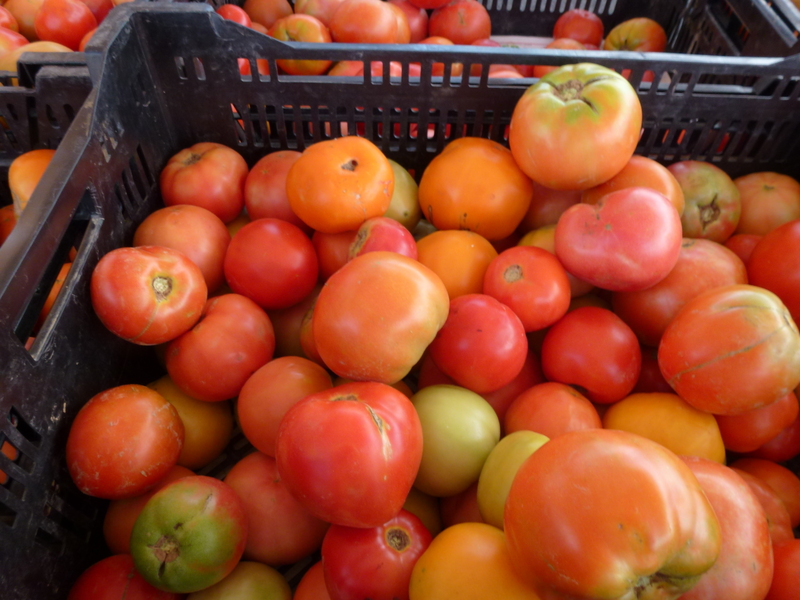 Eating locally and eating seasonally help us understand. When I first moved into our new house, the first thing I planted was asparagus. True, we would not benefit from this food source for three years. Every year after that and probably for as long as we lived there, this spring delacy would be ours to enjoy for years to come. 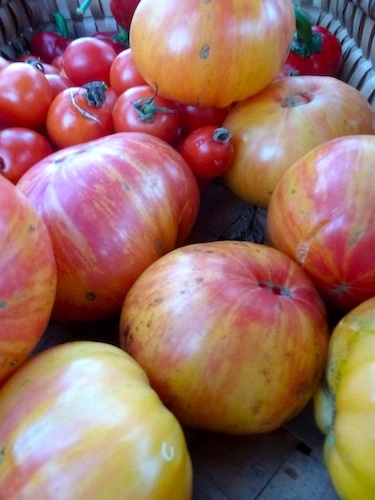 A surprise to many gardeners, tomatoes are really a perennial. Well, not in my back yard. Where they are native, tomatoes are perennials. Most folks here in the U. S. treat them as annuals. At the first hint or suggestion of a frost, tomato plants just cry and die. I am glad that there are both annuals and perinnials. in my front yard, vegetable patch, patio containers. Have you seen Quills and Thrills? I like this perennial because it is a low maintenance rebloomer. These flower quills never roll out or unquill, they don’t fade and are blooming now, in October. It will continue to bloom until the first frost. Before that frost, I’ll go out and cut a bouquet. 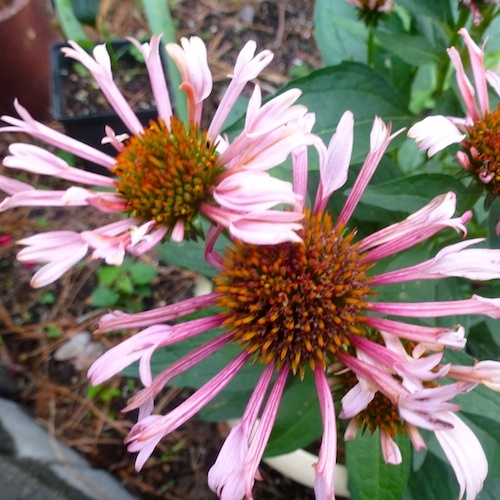 These Quills and Thrills blooms, are on sturdy stems for a long lasting bouquet. I believe in supporting the people who support our community. Support local efforts in community betterment. These folks are trying to raise money the best way they know how. A car wash and bake sale raising money for breast cancer. 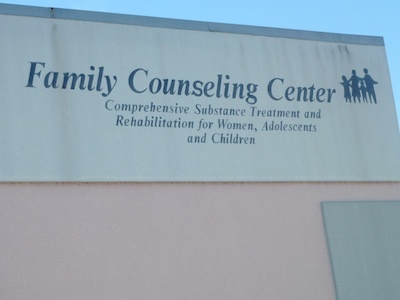 One of the counselors has breast cancer. Everyone pitched in to help.